Many stores can customize jackets and other articles for interested customers, so ask if something strikes your eye but is not in your size or color. Most shops can do this in a day or two, though to avoid disappointment, start shopping early on. You won’t find the bargains your friends might have told you about if they went in the early 2000s to Argentina, but prices remain reasonable overall. One thing to think about in particular is the Murillo Street Leather District in the Villa Crespo neighborhood, bordering Palermo Viejo. Below are a few places in the district, including Murillo 666, one of the largest of them. Items are often made above the storefront, or nearby. The greatest concentration of shops here is Murillo between Acevedo and Malaria, with the whole area having a few dozen shops. You can find everything from leather jackets to purses, luggage, furniture, and more. Many stores are owned by Orthodox Jews and will be closed early on Fridays and Saturdays along with holidays. Keep that in mind if your vacation is over one of the Jewish holidays. Here are a few favorites. Ask your hotel about the myriad of other options, or look for shopping maps and booklets like Go Palermo or the Mapas de Buenos Aires shopping map series. Both the English-language publications Buenos Aires Herald and the Argentina Independent have great articles on local shopping too. Here you’ll find an excellent selection of women’s coats and accessories including hats to purses to fur gloves. There’s also a selection for men from small items like hats, wallets, and belts, to leather jackets. The staff is very attentive. Location: Murillo 525 in between Malabia and Acevedo in Villa Crespo). Metro stop Malabia. This is considered by many to be among the best leather shops in Buenos Aires. In Casa Lopez, you’ll find an amazing array of Argentine leather products. Location: Marcelo T. de Alvear 640 and 658, at Calle Maipu off overlooking Plaza San Martin near the end of Calle Florida pedestrian zone. Metro stop San Martin. You’ll find an absolutely gorgeous selection of women’s handbags here along with shoes. Most are reasonably priced, along with interesting details from the zippers to embedded crystals. There’s also an array of handmade jewelry products here too. Designs are divided into two main types here – pretty and feminine, to native Argentine-inspired design. There is also a branch of this store in the Patagonian resort town of Bariloche. Location: Calle Venezuela 1454 between San Jose and Saenz Pena in the Congreso area. Metro stop Saenz Pena. El Nochero is one of the best places if you’re looking for a leather gift for yourself or someone else that says Argentina all over it! Highest quality Argentine leather and craftspersonship goes into making everything from shoes to boots, to clothes to decorative silverware including yerba mate cups. Location: Posadas 1245 inside of the Patio Bullrich Mall in Recoleta/Retiro. No nearby Metro stops. Here’s the highlight of the Villa Crespo neighborhood’s Murillo Street Leather District. 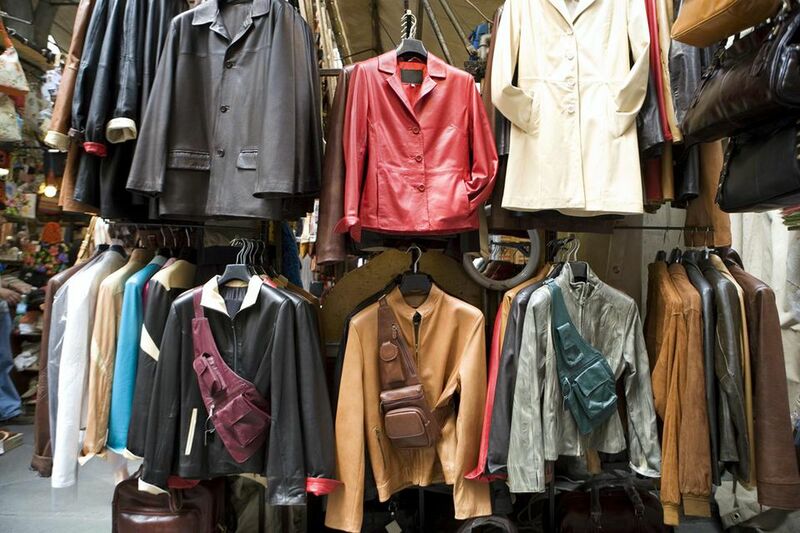 You will find almost anything that could be made of leather here, from women’s coats and accessories to one of the largest assortments of men’s leather jackets in the country. Almost anything can be custom-made too. While it might not do for a quick souvenir, they also have a large furniture selection. Officially, it is the same price for credit or cash, but you might still find some bargaining power with cash. Location: Murillo 666 between Acevedo and Malabia in Villa Crespo). Metro stop Malabia. You’ll find a great selection of coats and other items for men and women in this Murillo District leather factory outlet. They also have leather luggage and gym bags that you can use on other trips or back at home. Definitely, a place to bargain also, and they take most credit cards. Location: Murillo 624 between Acevedo and Malabia in Villa Crespo. Metro stop Malabia. This is one of my favorite leather stores in Buenos Aires. Amadeo Bozzi, the owner, concentrates on leather goods largely for women, and accessories for both men and women, along with some items for the home. Virtually everything is produced in Argentina and well designed and well made. You’ll find some items have native materials used in them that are crafted by the native tribe Wichi from the Chaco region. The store is appointment only. Location: Scalabrini Ortiz 2330 between Charcas and Guemes. Metro stop Scalabrini Ortiz. Some of the most interesting and unusual designs can be found in this store. Cesar Franco first started designing for tango dancers and the theater, and this shows in his clothing. There’s everything from sportswear to wedding dresses, and it is his fascinating leather coats, often made by marrying leather strips with richly designed fabric that really catches the eye. The designs have a Renaissance sensibility to them. Location: Rivadavia 2206, 1st floor, Suite A at Uriburu. Metro stop Congreso. This is one of the finest leather stores in all of Argentina, with roots back to 1868. Visiting royalty from the King and Queen of Spain to Prince Philip have shopped here. You’ll find everything from saddles to boots. There are several branches including at the Galerias Pacifico Mall at Florida and Cordoba Streets.